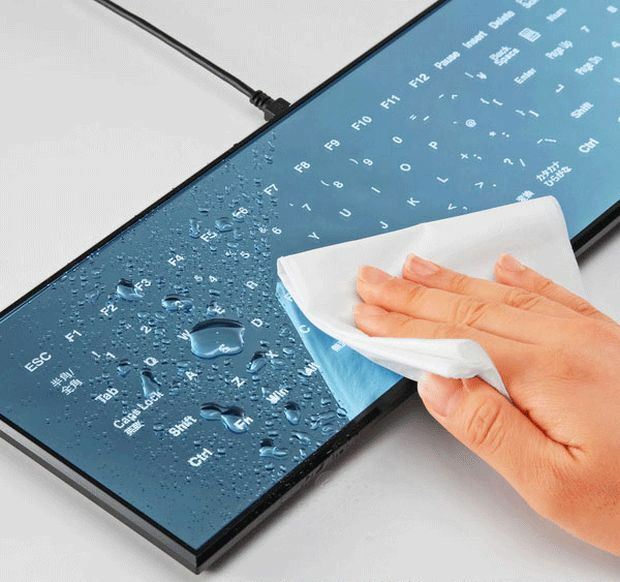 Designed by world renowned industrial designer Dr. Kazuo Kawazaki, the Cool Leaf keyboard is a glimpse into the future: an elegantly tailored tool fusing the utility of a touch-screen with a brilliant, easily serviceable, mirror-like design. If you’ve been wanting a sleek and minimal keyboard for sometime, you should definitely look into the Cool Leaf Touch Screen Keyboard. This incredibly designed keyboard is, as the title says, a large touch screen with a 108 full QWERTY keyboard display; a very beautiful display. Each key is individually backlit to provide optimal lighting under any light condition, so a glare won’t be an issue. With each successful press, a corresponding beep will chime and the sensitivity of the keys can be adjusted to the speed of even the most experienced writers. Unfortunately, there isn’t any other feedback of confirmed button presses such as a small vibration. One of the best assets about this keyboard is when it’s shut off. The mirror-like surface is a real eye catcher and will add an incredible aesthetic and a bit of class to your PC or Mac set up.